What are you waiting for? Buy any of my eBooks and make your day even more exciting. ​The eBooks are all about adventure,science fiction, self help and real ghost stories. 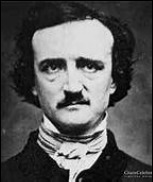 I’m Edgar Allan Poe, famous author & writer of some note who wrote scary books and poems when I was alive. I want to recommend and encourage you to read all the ebook’s written by Darren James and poetry by Dennis Davis. The series of ebooks “Ghosts Around You” will convince you that ghosts really do exist a scary read indeed. I especially liked the ebook “My Journey to Hell and Back” and I am so glad that I am here in Heaven what a nice surprise, I always questioned rather I would make it here or not. My good friend Mark Twain wanted me to say he is also a big fan of Darren James & Dennis Davis's writing as well. Edgar Allen Poe; Deep into the darkness peering long I stood there, wondering, fearing, doubting, dreaming dreams no mortal ever dared to dream. This is a unique science fiction story that will blow your mind a story like has never been written before. Imagine what would happen if a large spaceship landed near the Washington Monument on the green belt in Washington D.C. unexpectedly one morning. Are the aliens here to help us or harm us, what do they want? Save your life from the police of the 16th Dimension don’t do drugs. Go ahead make my day, take this trip alone if you dare to HELL that is. We all make choices chose well to avoid HELL it’s very hot down there. Discover the underbelly of New Orleans in the macabre. eBooks, science fiction eBooks, real ghost story eBooks, adventure eBooks, life changing eBooks, free eBooks, poetry. Say hay, I'm Dennis Davis so glad you stopped by take a look at my eBooks written by me using my pen name Darren James. I hope you'll stay awhile take a look at my poetry & check out the free help eBooks and visit often, thank you. please click on the three small lines on the left at the top of this page. to purchase here and your info is secure. Scamadviser.com has given their blessing to my website with the highest trust rating and says, "This site is safe to use." My eBooks are fiction and science fiction and one eBook is a book to help you in life to recognize and avoid evil people and six are real true ghost stories. I have written 12 eBooks and provided two pages of my poems. Also you will find a number of FREE eBooks I have chosen to be of help to you in your search for life's success; in business, health and your personal growth. My eBooks are also published by Amazon Kindle, Barns and Noble, Smash Words and Kobo because they are recognized as great reads.